This was one of my very first bulletin boards in our school counseling lobby when I first started at my school. Seeing how it went pretty viral on Pinterest was the reason I wanted to start this blog. I wanted to link back to somewhere where people could find, use, and share resources. I hand cut this "font" to look like Dr. Seuss letters. Surely there's something you can find on Teachers Pay Teachers that's an actual Dr. Seuss font. Those were just long before the days I knew anything about TPT. This is a closer up of the bulletin board. 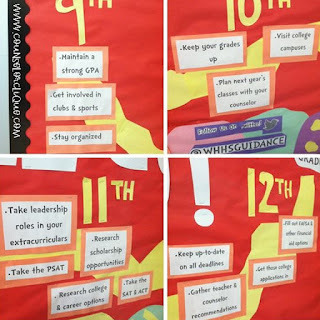 I honestly think I just asked other counselors what I thought might should go under each grade level. If you've been working in this long enough, you could probably come up with your own. At this point after working with all different grade levels, I'd probably change it up! 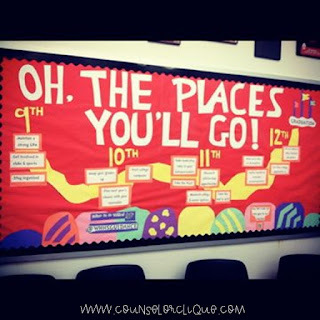 Check out the rest of our collaborative bulletin boards on one Pinterest board HERE!